Traps are available for a number of different sweet corn insect pests including European corn borer, fall armyworm and Western bean cutworm. For these pests they can provide interesting data and help to monitor population hot spots across the province. However, at the individual farm level, the easily identifiable eggs and larvae mean that these pests can be just as easily monitored through field scouting. Corn Earworm is an entirely different challenge. It is stealthy little creature. It arrives unexpectedly in summer weather fronts, and offers only the briefest amount of time during which it can be controlled. The critical control period is literally less than two inches long. That is the amount of space it takes for the young larvae to move from where it was hatched on the silk to the protective cover of the husk. Once inside the husk, it is no longer controlled through pesticide applications. Even natural predators, such as trichogramma wasps, have a hard time navigating through the husk. As a result, the timing and coverage of insecticide applications is of utmost importance. 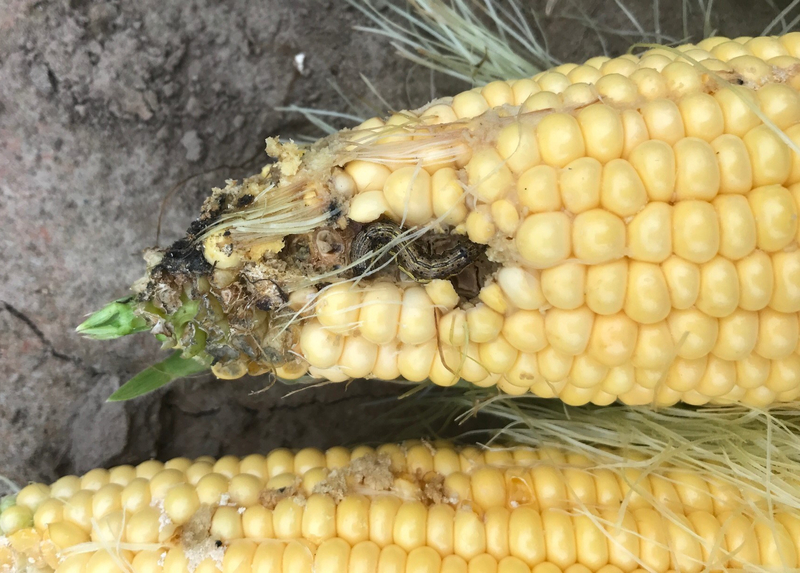 Sweet corn becomes attractive to corn earworm moths at the green silk stage. Insecticides applied prior to this time will do little to control the corn earworm. From tassel emergence through pollen shed, visually scout for pests such as European corn borer or Western bean cutworm. Both pests are easily identified at this stage by their egg masses. Pyrethroid (group 3A) sprays are still very effective for these pests. Earworm moths travel from the Southern United States in the summer storm fronts. As the Atlantic storm season becomes active, we start to see increased numbers of moths in the Great Lakes Region. Once green silks are present, pheromone traps become a valuable tool to monitor the movement of this pest in to the region, and identify fields or areas at risk of becoming infested by the earworm. Unlike the other two lepidoptera pests, earworm eggs are not easily found while scouting. Corn earworm is resistant to the pyrethroid class of insecticides. Currently, earworm control is achieved with the diamide (group 28) class of insecticides, including Voliam Xpress and Coragen. Lannate (a group 1A insecticide) is also registered. In order to get the best performance from earworm insecticides, they need to be applied at green silk. If moth numbers are high during silking, more than one may be required. While these products do have residual activity, the fast growing nature of the silks means that the newer silk tissues are not protected. Once the silks dry down, the female moths are no longer attracted to them as egg-laying sites. For more information on the corn earworm, visit http://www.omafra.gov.on.ca/IPM/english/sweet-corn/insects/corn-earworm.html. There are a few sites that monitor and predict the movement of insect pests into the Mid-west and North Eastern United States. Examples are shown below in Figures 4 and 5.